The wild-type or so-called “normal” cockatiel has only two colors – yellow and black. The general grey feather results from a mixing of black and white or black and yellow. When a feather that would otherwise be grey lacks yellow, it is black. Likewise, if a feather that should be grey has no black, then it will be yellow. Where the feather lacks both of these colors, the feather is white. As yet, no one seems to have given the yellow color a name. It has sometimes wrongly been called a carotenoid pigment. Carotenoids are taken directly from plant tissues and require little modification by the birds. However, the yellow of parrots is seemingly quite distinct from this and is completely synthesized by the parrot. It may be exclusive to this order of birds. Yellow must be fairly easily synthesized by the cockatiel and other parrots from the most simple of diets because nothing seems to affect its intensity. It may seem quite odd considering the enormous variety of colors available in parrots, that their oranges, reds, blues, greens and purples are formed of the same black and yellow. The blue found in parrots is not a pigment but results from a layer of colorless and extremely minute microscopic rods running over a central core of the black pigment. Blue is the consequence of light striking this refracting layer, and the green comes from the mixing the blue with the yellow. There is a good reason to assume that red and orange are simple chemical modifications of yellow, and they will be treated as if they were the same. The breeding of cockatiels for improvements in their color, or for the development of completely new color forms can add a fascinating depth of the bird-keeping hobby and it can also be very profitable. Hey Michel! How are you doing today? I’ve read your blog on Yello and Black Cockatiel and loved it as it contains tonnes of valuable information. I’m planning to get one but I have a couple of questions that I would like to ask. What type of food do you feed them? And what type of environment would they feel comfortable staying in? Thanks in advance for answering my questions. Well done!! My older brother has a Cockatiel and really loves it. He and his wife have interacted with this bird in so many ways, which causes me to want to know more about them. For years, my brother and sister-in-law thought their Cockatiel was a male, but recently, she started laying eggs. I know how to tell the difference in some animals, of course, but I was wondering if there is a simple way to tell with Cockatiels? I have also wondered how trainable these birds are. They must be very gentle birds, in my opinion, as it seems that many people enjoy having them around. How long do they generally live? Are Cockatiels good with children? Your comments about the coloring was very interesting. I love learning things like that. I didn’t realize that the coloring in birds could be affected by different things. I Really enjoyed your article! Thank you so much for posting it. The reason why cockatiels are so popular is because they are so easy to train. It is difficult to tell the difference between males and females when it comes to some of the color mutations, but in general the males are more brightly colored than the females. The females a lot of the time have spots in their tails. 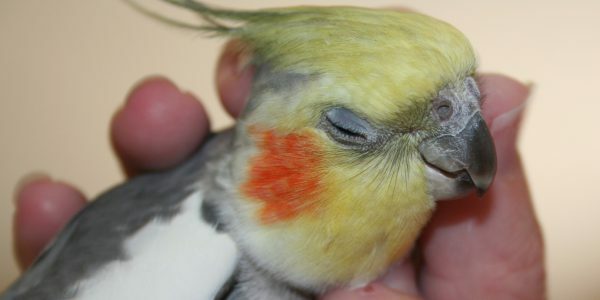 A well looked after cockatiel can live between 15 and 30 years. Thanks for your comment and glad you enjoyed my article. Your color descriptions also brought memories of my time working in the ink manufacturing industry, matching colors. We had to use basic combinations of Magenta, Cyan, and Yellow, but we also had bases in green and black. Several friends over the years had Cockatiels, and I was amused by their antics and amazed at how trainable they were…also very friendly, although I imagine not all are. I bookmarked your site in my “Pets” folder and intend to read more. Thanks for a most enjoyable read. Thanks for stopping by Joe. Yes most are friendly, unless they are not used to being with humans from a young age, then they can be aggressive. Are You Ready To Own A Cockatiel?